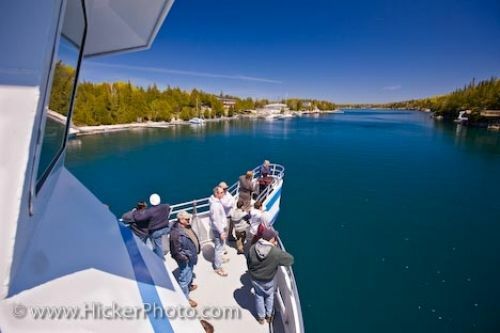 Passengers on this boat tour, board the Great Blue Heron in Tobermory, Ontario to journey around the picturesque areas of Lake Huron in the Fathom Five National Marine Park. The Great Blue Heron is a glass bottom boat which has a capacity of 125 passengers and tours for 2 hours to various tourist attractions on Lake Huron. When the Great Blue Heron leaves Little Tub Harbour in the downtown core of Tobermory, Ontario, its first stop is at 2 nineteenth century shipwrecks. From here, the boat travels to Russel Island, White Rock, Cove Island and the harbour, around North Otter Island and then around Flowerpot Island to see the sea stacks. A snack is provided to the passengers along with the amazing scenery of Lake Huron. From the middle of May until the middle of October, boat tours depart daily and it is wise to book ahead as these tours fill up quickly especially during the summer months. Picture of passengers on the Great Blue Heron boat tour traveling on Lake Huron in Fathom Five National Marine Park, Ontario.